This book explores the historical inter-relations between international law and revolution, with a focus on how international anti-capitalist struggle plays out through law. The book approaches the topic by analysing the meaning of revolution and what revolutionary activity might look like, before comparing this with legal activity, to assess the basic compatibility between the two. It then moves on to examine two prominent examples of revolutionary movements engaging with international law from the twentieth century; the early Soviet Union and the Third World movement in the nineteen sixties and seventies. The book proposes that the ‘form of law’, or its base logic, is rooted in capitalist social relations of private property and contract, and that therefore the law is a particularly inhospitable place to advance revolutionary breaks with established distributions of power or wealth. This does not mean that the law is irrelevant to revolutionaries, but that turning to legal means comes with tendencies towards conservative outcomes. In the light of this, the book considers the possibility of how, or whether, international law might contribute to the pursuit of a more egalitarian future. 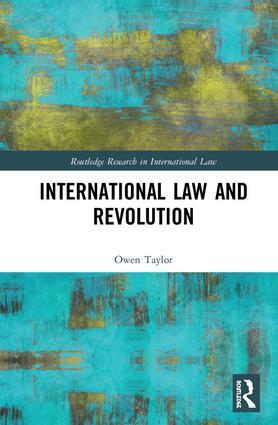 International Law and Revolution fills a significant gap in the field of international legal theory by offering a deep theoretical reflection on the meaning of the concept of revolution for the twenty-first century, and its link to the international legal system. It develops the commodity form theory of law as applied to international law, and explores the limits of law for progressive social struggle, informed by historical analysis. It will therefore appeal to students and scholars of public international law, legal history, human rights, international politics and political history. V: Common International Legal Practice? Owen Taylor is an independent researcher, currently based in Marseille. He completed his doctorate in Law at SOAS, University of London.